The new White House CS for All initiative seeks to empower all students to “learn computer science and be equipped with the computational thinking skills they need to be creators in the digital economy”. This worthy goal is hampered in many schools, particularly those in low-income areas that serve many of our underrepresented students, by the lack of an effective bridge to move students academically to where they can successfully participate in the AP Computer Science (CS) courses that might lead to participation in the CS workforce. In Georgia, there are two primary routes to CS—through the advanced track, where students take AP CS along with other AP courses, or alternatively through the Career, Technical and Agricultural Education (CTAE) program. Georgia has developed a CTAE CS Pathway that culminates in students taking AP CS. Few students, however, are successfully navigating that path. In Georgia’s largest school system, with 55,000 high school students, only 234 students enrolled in AP CS in 2015, with Latinos/African Americans matriculating into the advanced courses at half the rate of their White/Asian peers. Clearly, creating the path hasn’t created demand among students. 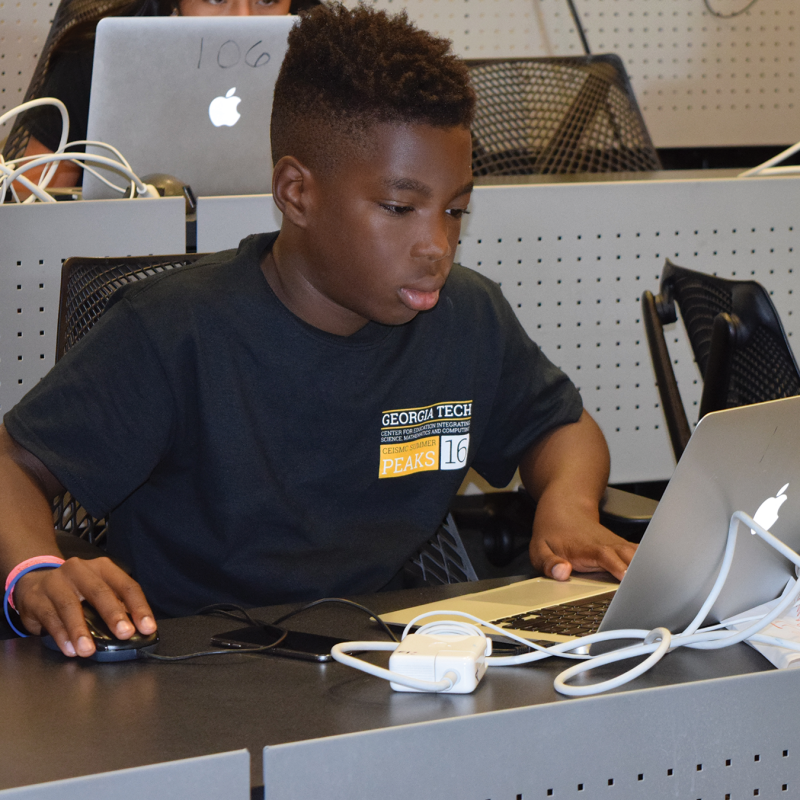 The entry-level CTAE CS course, Introduction to Digital Technology (IDT), tends to focus on lower-level computing skills and computational thinking (CT) knowledge that is essentially disconnected from the math and science content that students learn in their core classes. One strategy for increasing high school student interest, both in CS and other STEM fields, is to create an educational experience that links the two in a way that students find engaging and relevant to their lives. Bransford et. al.’s How People Learn established norms for effective learning communities: 1) a focus on learners organizing knowledge, 2) continual and authentic knowledge assessment, and 3) community-based learning, where failure and collaboration play key roles in learning. These norms provide rationale for exploring a new version of the IDT course that engages learners in authentic and meaningful contexts to learn skills and concepts, and where STEM and CS are interleaved. A team from Georgia Tech will collaborate with two partner school systems to create, pilot and assess a new IDT curriculum. The curriculum, to be implemented in two schools with large underrepresented populations, will promote the development of rigorous CT skills by engaging students in authentic and culturally relevant problem-based, inquiry learning (PBIL) projects in STEM topics, such as resource sustainability. Student-created multimedia digital narratives consisting of web pages, mobile applications, and computationally generated music will showcase student learning and their solution to the PBIL challenge. In the process, students will become proficient with a variety of computational tools such as PowerPoint, ARIS and EarSketch (a digital platform that teaches programming through music mixing). CAPACiTY will integrate STEM throughout the course with: (1) Project contexts that require exploration of the STEM concepts; (2) Challenges that engage students in science practices; and (3) Links between the NGSS Crosscutting Concepts (CCs) and the analogous CT disciplinary ideas. The research will focus on determining the impact of the newly revised IDT course on students and teachers: how the curriculum influences students’ computational thinking, perceptions of computer science, and understanding of Crosscutting Concepts, and how teacher professional development activities influence classroom practices. The research will also explore how this PBIL-driven and culturally relevant CS curriculum affects student engagement, motivation, content understanding, and persistence in CS courses, particularly among students traditionally underrepresented in CS. In addition, we will use complex systems modeling to explore the school and district-level factors that positively or negatively impact the intervention.